The player character is a 20-year-old queen named Catherine; she is nine months pregnant. She is being held in her chambers by a knight ordered there by Prince Harold, her husband's son. It transpires that there are a number of people conspiring against her and her unborn son, including the Prince. Over the course of the game, Catherine can use various magical powers she possesses to improve her son's chances of survival and prosperity, at an increasing cost to herself. Spring Thing 2007: 1st place of 4 entries. XYZZY Awards 2007: Finalist in 3 categories: Best Game, Best Story, and Best Use of Medium. Beta-testing by Annette van de Kraats, Eva Deinum, Remko van der Pluijm, Cassandra Palop, Anthony Phillips and Ryusui. Or download Fate.z8 from springthing.net's mirror. 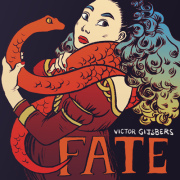 Victor will release the source code for Fate and is encouraging an open source development of a new version of the game, see the raif thread OpenFate - an experiment begun on April 30, 2007 for details. However, the OpenFate project met with little response and has been put on indefinite hold. Fate (archived) - at Baf's Guide. Fate - at ifwizz interactive fiction (in German). Source code at the IF Archive. This page was last modified on 26 December 2016, at 23:12.